Agra is situated 200 km south of capital city New Delhi. Agra is easily gettable by road and train from all the major cities of India. Agra is home to India’s iconic monument Taj Mahal built by Mughal emperor Shah Jahan in 16th century in the memory of his wife late Mumtaj Mahal. She was married to Shah Jahan at the age of 18 years and died at 39 years at the time of delivering her 14th child. It is believed to say that six of them survived out of her fourteen children. What attracts tourist the most is, a remarkable engineering work applied on marble used in making of Taj Mahal. Incredible inlay work and filigree on the marble can be seen on the walls of Taj Mahal that signifies an exceptional engineering work done in 16th century. The construction of Taj Mahal started in 1631 and completed in 1653. 20,000 workers had been labored for 22 years by Mughal emperor Shah Jahan to complete the Marble wonder. Precious and semi precious stones were used in intricate marble work. The marble used for building Taj Mahal was brought to Agra from the place called Makarna near Jodhpur in Rajasthan in 16th century. Taj Mahal is closed on Friday for visitors. Agra is also famous for leather items, marble replica of Taj, marble tables etc. Taj Mahal is located on the banks of river Yamuna. It is basically a mausoleum and a fine example of Mughal art. Red fort in Agra can also be seen from here. Agra fort built by Mughal Emperor Akbar in 1565 and initially known as walled city. Mughal emperor Shah Jahan said to have deposed and restrained by his own son Aurangjeb in the fort where he spent last eight years of his life, looking at Taj. Taj Mahal is UNESCO world heritage site. It is one of the Seven Wonders of the World. Agra is well connected by road and trains from New Delhi. 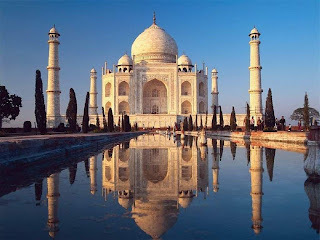 Though one can reach to Agra from any places in India directly but going to Agra from Delhi is an incredible experience. Train tour from Delhi has turned out to be favorites amongst travelers. There are two options to get Agra from Delhi, either by road (Yamuna Expressway) or by Shatabdi train. Travel time has been reduced to 2 to 3 hours since Yamuna expressway introduced as compared to the old highway to Agra. Kilometers have also been reduced to 165 km from 210 km. It is an incredible expressway to experience. Traveling by train is more comfortable way to get Agra to see Taj Mahal. Though there are several trains available for Agra from Delhi but Shatabdi is most suitable train to use for Same day Agra tour as it reaches Agra in two hours from Delhi. Starts at 6 am in morning arrives Agra at 08 am. Departure time of train for returning is at 08:30 pm, which allows visitors a maximum time to spend in visiting Taj Mahal, Agra Fort and Fatehpur Sikri. All three sites are UNESCO world heritage sites.